Today many people are not aware that the Trek Boers laid the foundations of the Grootfontein District and played an important role in the further development of this historical town. In former times, Hai?om-Bushmen and Bergdamara inhabited the area around Grootfontein. Although the OvaHerero had also temporarily dwelled here in the past, they left and never returned out of fright of the Bushmen, who robbed their cattle and dug copper for the AaNdonga, who regarded the area as part of their country. Between 1874 and 1881, the so-called Thirstland Trekkers moved from West Transvaal in three major treks through the Kalahari, along the southern banks of the Okavango, via Namutoni, Kaoko Otavi, Rusplaas and the Kunene River to Humpata in Angola. At the Okavango, the adventurer and trader Will Worthington Jordan joined them in 1878. He soon became their intimate friend. Many of the Boers did not feel at home in Angola. Thus, in 1884, a number of them decided to either return to Transvaal or to settle in the Rehoboth area, which Jordan had purchased for them. However, the plan was shattered as the area had been allocated to the Basters. Jordan thereupon bought the land around Grootfontein from the Ndonga-chief Kambonde Kampingana in April 1885. The area measured 957 square miles and stretched from Etosha Pan in the north, from Okaukuejo and Naidaus in the west and from there in a straight line across to the Omuramba uamatako in the east. For this tract of land Jordan paid 25 guns, a ‘salted horse’ and a casket of brandy. The Bushmen and Damara were not recognized in this transaction at all. Shortly afterwards around 20 Trek Boer-families settled at the place called Otjivanda tjongue (leopard hill) or Gei-?ous, which they called ‘Grootfontein’. Their names were Labuschagne, Prinsloo, Bouwer, Venter, Van Vuuren, Du Plessis, Opperman, Botha, Robbertse, Jordaan, Du Toit, Lourens, Holsthuizen, Du Preez, Van den Berg, De Klerk and Van Wyk. In October 1885, they concluded a treaty with Jordan and founded the ‘Republic Upingtonia’; it was named after the Prime Minister of the Cape Province, Sir Thomas Upington. Upon Jordan’s initiative a council was elected, which consisted of 13 members. G.D.P. Prinsloo was president, C. Leen secretary, Louw du Plessis magistrate and D.P. Black ‘veldkornet’, while B.D. Bouwer was commandant. 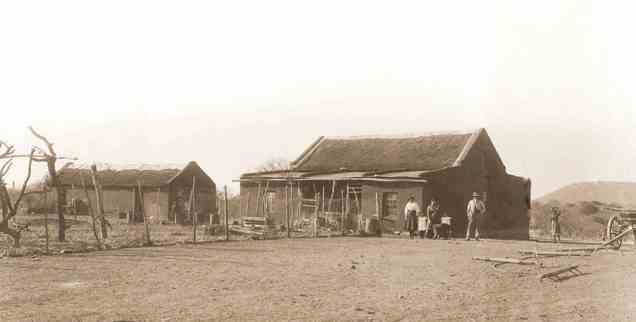 Initially the Boers remained together and erected some rudimentary block huts around the fountains of Grootfontein. Later they built so-called hartebeest houses on their farms. In the lower lying areas they cultivated wheat, mealies and tobacco. The water from the fountains was used for irrigation. Between 1885 and 1887, 43 farms, which measured around 3,000 acre, were allocated to the Boers. Amongst these were some of the still known farms, e.g. Strydfontein, Rietfontein, Tygerfontein and Bavejaansfontein. At the end of 1885 a number of Boers left and moved to Waterberg. Meanwhile, Herero-chief Maharero had rejected the bill of sale as he maintained that the area belonged to him. Together with his agent R. Lewis he installed a trade embargo against the Boers. In addition, Kambonde’s brother Nehale murdered Jordan in June 1886 near the mission station Omandongo and near Grootfontein Bushmen killed the Boer Du Toit. Henceforth the Boers called Upingtonia ‘Lydensrust’. 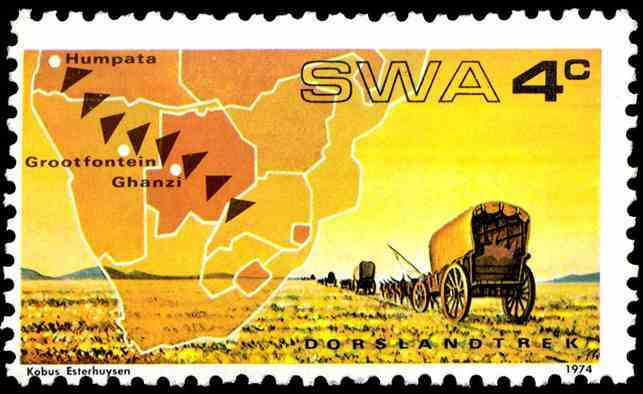 In April 1887, the Swiss scientist Hans Schinz visited Grootfontein and described the Boers in a favourable way. Although the German government had extended its protection over the Boer Republic at the end of 1886, they could not expect any protection, as there were no protection forces yet. Malaria, which took a large toll amongst the Boers, and continued attacks by Bushmen broke their strength and hope. In mid-1887 they left Grootfontein and returned to Transvaal and Angola. Some of them settled at Omaruru to become transport drivers. Read further in the next issue on the second group of Trek Boers, who settled at Grootfontein. Looking for more info regarding the dorsland trekkers living on Strydfontein in the grootfontein district. I am tying to set up a cronic of the farm Strydfontein as we owned the farm from 1939 to 1958. Can anyone help me, I would appreciate this very much. Post.thanks *WONDERFUL to share… Wait …;) He’s certainly a lot of details like that to take into consideration. It’s a big moment. I offer thoughts above as general inspiration but clearly there are questions like the one where you get more important will be good faith. I don’t know if best practices have emerged on things like that, but I’m sure your work is clearly identified as a game. Both boys and girls feel the impact of a moment’s pleasure, for the rest of their life. I think this was a bad deal as the Ondonga Kings were just paid peanuts for large tracks of Land. Upingtonia was part of Ondonga/Owamboland and it was a most important part of their Economy,Copper mining and hunting. p432140 on Have you ever danced the Nama Stap in Namibia? p432140 on Do you remember playing carrom or finger board in Namibia? Subscribe to our blog, to receive the latest stories & tips on Gondwana & Namibia.